Does this look like springtime on a platter or what? I am so ready for spring, but the weather is not cooperating. 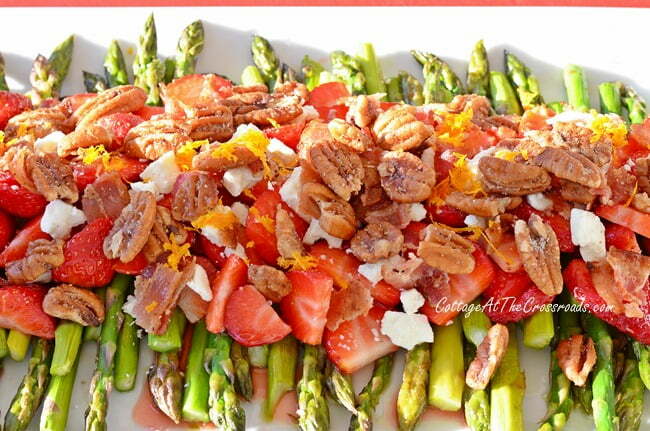 So to bring a little springtime to us, I made this asparagus strawberry salad with orange balsamic dressing recently. It is, without a doubt, the ultimate springtime salad. Asparagus is available year round, but it tastes freshest in the early spring. We have some growing in our garden, but it’s been so cold that the stalks haven’t even broken ground yet. So to my delight, our local Harris-Teeter had asparagus on sale last week for $1.99 a bunch! 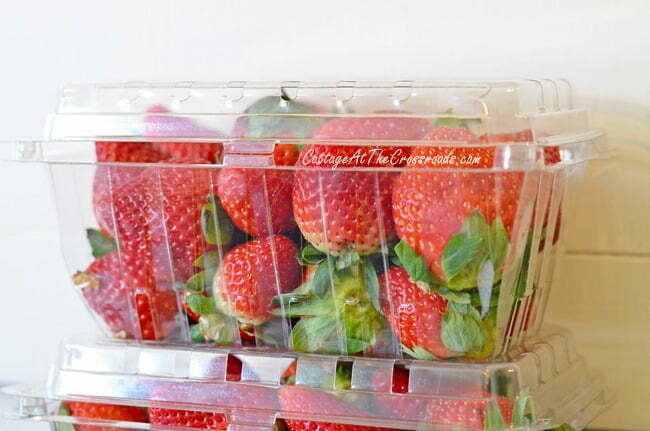 And at the same time, these strawberries were buy one-get one free! 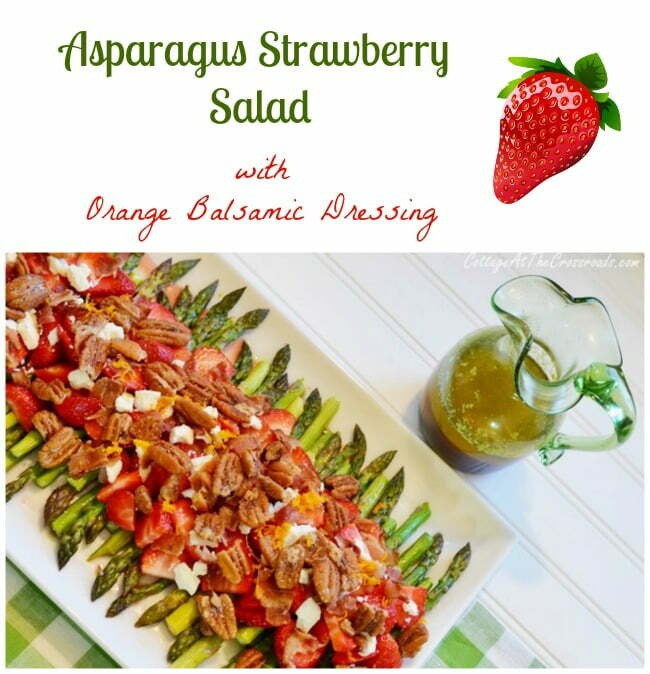 As soon as I saw them, I knew that I was going to make this asparagus strawberry salad. To make the salad, first pan toast about 1 cup of whole pecans along with 1/2 stick salted butter in a skillet over medium heat. 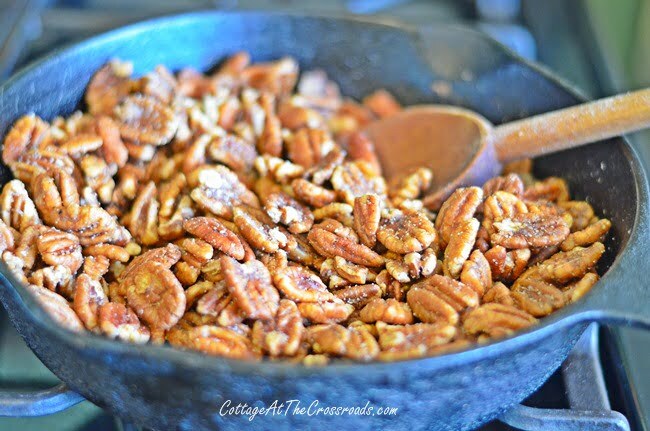 Watch the pecans and stir frequently to avoid burning them. After about 10 minutes, remove them from the heat and add 1 teaspoon ground cinnamon and 1/2 cup sugar. Stir to mix thoroughly and set aside. Now, getting back to the recipe. Next, you will need to cook 4 slices of bacon until crisp in a skillet. Remove the bacon and pour off the grease but do not wipe out the pan. Drain the bacon on paper towels and then crumble when it’s cool. Add 1/4 cup olive oil to the pan and stir to loosen any browned bits from the bottom. 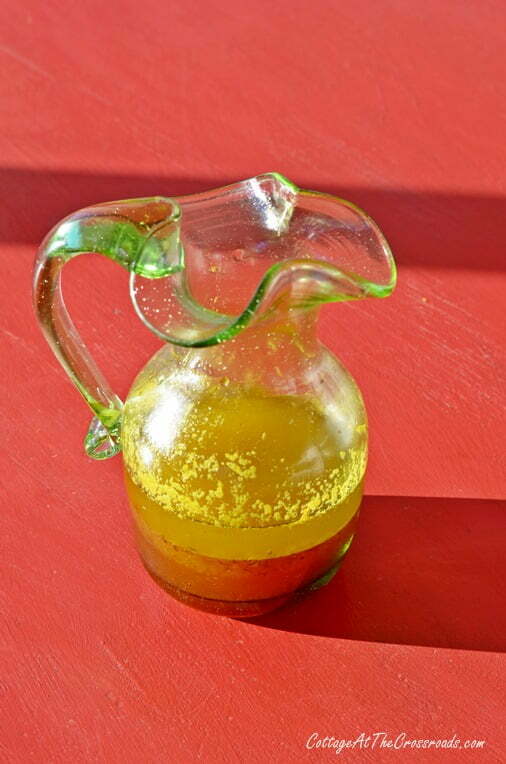 Remove from the heat and add 2 tablespoons white balsamic vinegar and 1/4 cup of freshly squeezed orange juice. Stir together and set aside. When the dressing has cooled, pour it into a serving container. Next, preheat your oven to 400 degrees. Line a rimmed baking sheet with aluminum foil. 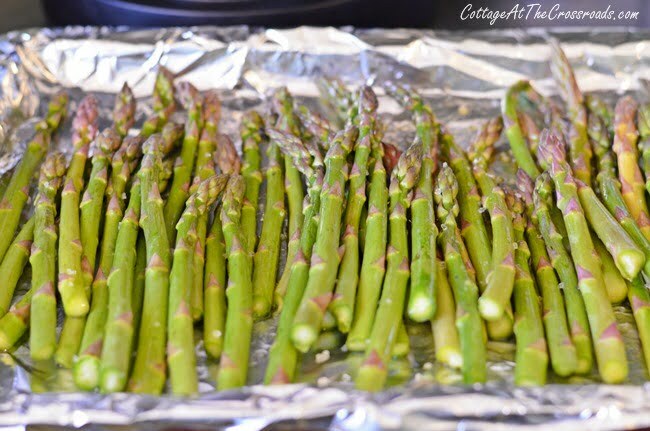 Wash and remove the tough ends of the asparagus and spread it in a single layer in the prepared baking pan. Drizzle the asparagus with 1 1/2 tablespoons olive oil and toss gently to coat. Sprinkle with 1 teaspoon sea salt and bake for about 10 minutes until it is still crisp tender. While the asparagus is roasting, wash and slice the strawberries. 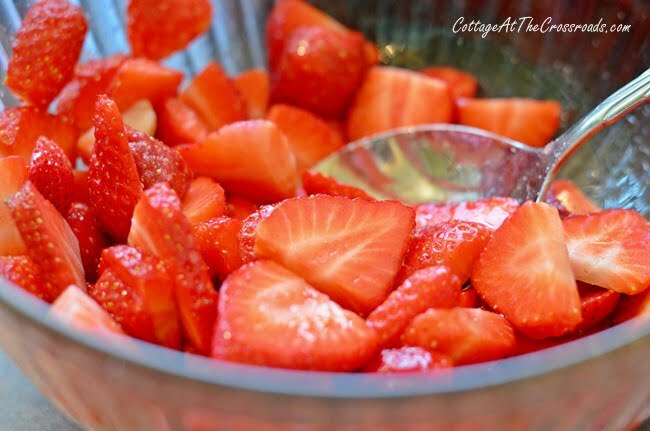 If the strawberries are tart like these were, you may need to add a little sugar or sweetener to them. Spread the roasted asparagus on a large platter. Layer the sliced strawberries, crumbled bacon, some feta cheese, and the toasted pecans on top. Garnish with a little orange zest, if desired. Before serving, drizzle the salad with the dressing or serve the dressing on the side. Even if it doesn’t feel like springtime outside, you will have spring on your table with this salad! If you’d like a printable version of this recipe, click HERE. By the way, I’m taking this salad to a virtual spring party that is being co-hosted on over 35 blogs. It’s The Scoop’s Mega Linky party where you’ll find all sorts of spring crafts, decorating ideas, and more recipes. And if you’re a blogger, we invite you to join in our party by linking up your favorite spring posts. Click on any of the links below to find plenty of spring inspiration! That looks so good! I am so ready for spring. We had snow again last night. Thank you for the recipe! And thanks for visiting my blog. I know you will love that cauliflower! Jane, this looks fabulous! I love all the components, so I’ll have to try them put together this way. My mouth is watering… Mmmmm!! Enjoyed being on The Scoop Spring MEGA Party with you! I just have to make this salad! Thanks so much for sharing it. It looks beautiful, sounds delicious and this is one good for us salad! Oh yummy! Thanks again! Shared and pinned today. Can’t wait to try this recipe. Love this as a great spring recipe!! Gorgeous plating! 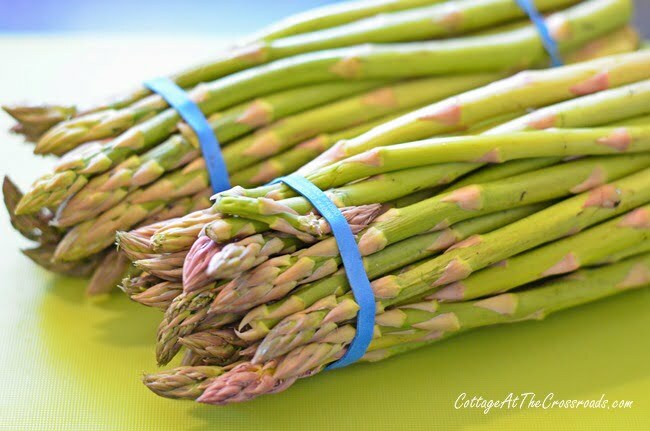 I am so glad asparagus is finally coming in season! Jane this looks and sounds so good. PINNED!!! Love strawberries and asparagus. What a beautiful salad! Your photography is wonderful too. I am so ready for Spring too! Thanks for stopping by. I am literally drooling right now. YUM. I want this for dinner tomorrow night for sure! All I need are the pecans!! Jane, what a beautiful presentation your salad makes! 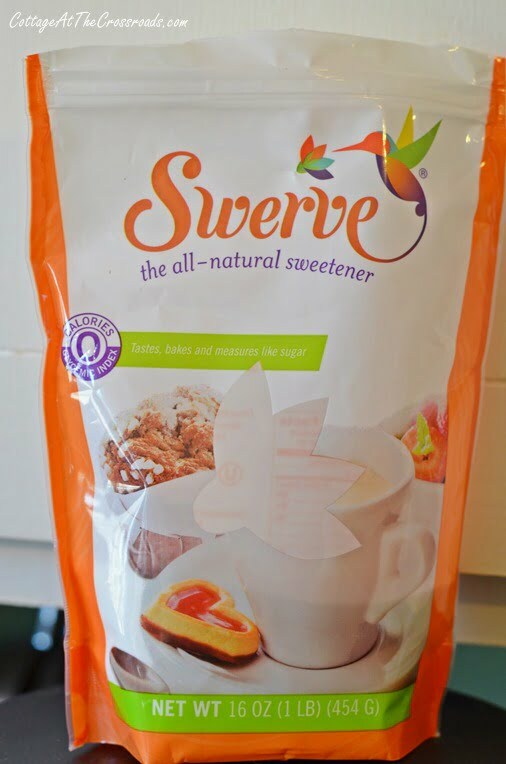 I’m very excited over the recipe and am very glad to hear your opinion of Swerve as I’ve wondered about the taste of it. Thanks to you, I’ll be adventurous and go for it! This sounds incredibly good and perfect for spring. It’s also different and not something that I’ve had before. I think I’ll bring it to the next pot luck I attend. Ya’ll need to try this. It is soooooo good. A fantastic array of favors.